The more we can “let that be itself” – the better. Helping to find the amount of possible allowance and being satisfied with that, is a key to successful integration. 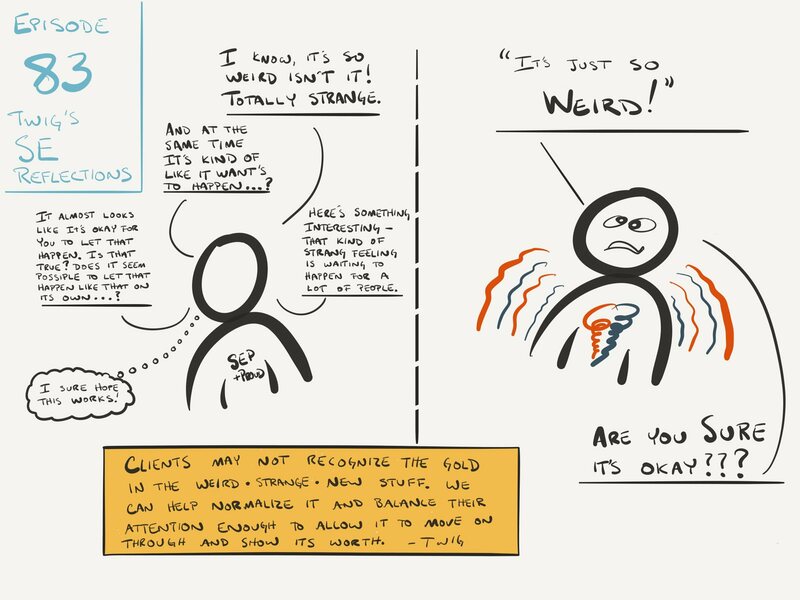 There’s a classic moment in SE sessions when a client is successfully moving through the activation cycle only to balk at allowing the discharge or deactivation phase because it “feels too weird” and indeed often times this phase includes truly odd, unsettling or even frightening sensations. It’s important to get adept at gauging how much allowance of this “wierd” experience can be tolerated and to work toward trying to limit the attention to the “strangeness” in a way that your client can be successful at allowing this very “new” impression to be felt and integrated in their somatic experience – as much as possible.